Gratitude is something that psychologists have started studying in a scientific way recently, thousands of years after its importance was recognized by philosophers, religious thinkers, and spiritual teachers. It turns out gratitude is strongly associated with quite a few aspects of psychological and physical well-being. According to research, grateful people have more positive emotion, life satisfaction, vitality, optimism, pleasant feelings, empathy, generosity, and less depression and stress. But how do psychology researchers know that’s not just because being a happy person causes gratitude? Or because having a good life causes both happiness and gratitude? One way to find out is by doing an experiment. You get a group of people to do a “gratitude intervention” (keeping a gratitude journal or gratitude lists, or some other activity that encourages gratitude) and see how it affects other factors. Even better if you have another group as a comparison where everybody is doing some similar activity that doesn’t necessarily encourage gratitude. In one experiment, the group of people who kept weekly gratitude journals had significantly better results on a range of psychological and physical well-being measures than the people in either of two comparison groups. The gratitude journal people exercised more regularly, reported fewer physical symptoms, felt better about their lives as a whole, and were more optimistic about the upcoming week than the other two groups (who recorded hassles in one group or neutral life events in the other). Participants who kept gratitude lists were more likely to have made progress toward important personal goals (academic, interpersonal, and health-based) over a two-month period compared to participants in the other experimental groups. In another study using daily self-guided exercises with young adults, the participants in the gratitude intervention group reported higher levels of the positive states of alertness, enthusiasm, determination, attentiveness and energy than the other two groups (who focused on hassles, or on how they thought they were better off than others). Also, the participants in the gratitude intervention group were more likely to report having helped someone with a personal problem or having offered emotional support to someone than those in the other two comparison groups. In a third study, this time of adults with neuromuscular disease, a 21-day gratitude intervention resulted in better sleep duration and sleep quality, greater amounts of high energy positive moods, a greater sense of feeling connected to others, and more optimistic ratings of one’s life, relative to a comparison group. The most robust effect across all three studies was the impact on people’s positive moods. All the participants were randomly assigned to groups. So the gratitude interventions led to the improvements in psychological and physical well-being, not the other way around. Set aside five free minutes each night for the next two weeks, preferably right before brushing your teeth for bed. Prepare a pad with one page for each of the next fourteen days. The first night, take the Satisfaction with Life Scale (page 63) and the General Happiness Scale (page 46) once again and score them. Then think back over the previous twenty-four hours and write down, on separate lines, up to five things in your life you are grateful or thankful for. Common examples include “waking up this morning,” “the generosity of friends,” “God for giving me determination,” “wonderful parents,” “robust good health,” and “the Rolling Stones” (or some other artistic inspiration). Repeat the Life Satisfaction and General Happiness Scales on the final night, two weeks after you start, and compare your scores to the first night’s scores. If this worked for you, incorporate it into your nightly routine. So here’s our special offer: Take our free two-week trial according to the description immediately above. If you don’t feel more alert, more enthusiastic, more determined, more attentive, more energetic, more optimistic, more happiness, and more satisfied with life; and if you’re not more helpful and supportive; we’ll give you double your money back! Emmons, R.A., & McCullough, M.E. (2003). Counting blessings versus burdens: Experimental studies of gratitude and subjective well-being in daily life. Journal of Personality and Social Psychology, 84, 377-389. Seligman, M.E.P. (2002). 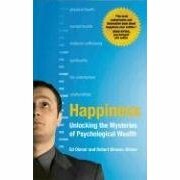 Authentic Happiness: Using the New Positive Psychology to Realize Your Potential for Lasting Fulfillment. New York: Free Press. p. 75. Hardcover : ISBN 0-7432-2297-0; Paperback (2004): ISBN 0-7432-2298-9.